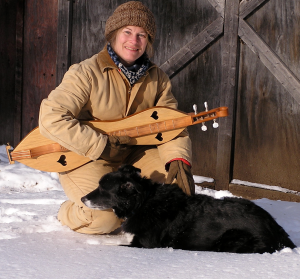 Once again long time Maine Fiddle Camp instructor, Pam Weeks, will be teaching Mountain Dulcimer during the June week . Pam started offering Mountain Dulcimer (also called Appalachian Dulcimer) at Camp in 2011 and it was an instant success. The class is open to all levels of experience and Pam can even supply instruments for those who “just want to try it out”! Pam is teaching mountain dulcimer during the June Week, June 16-21, 2019. Pam, from Bowdoin, ME, has been playing and teaching dulcimer for over 30 years and her early influences were Jean Ritchie, Lorraine (Lee) Hammond, Kevin Roth among others. She since has developed her own unique flat picking style and has recorded several albums featuring mountain dulcimer. One, The Trestle Bridge, is a solo dulcimer album, featuring Pam playing Irish, Swedish, Old Timey, Quebecois styles, as well as original material!! She has performed at numerous dances and festivals across the country and plays locally with several bands including T-Acadie, JimmyJo and the Jumbol’Ayuhs, and Scrod Pudding. A multi-instrumentalist, Pam also plays fiddle, guitar, cello, viola, mandolin, piano, flute, saxophone, Celtic harp and MORE. She teaches all the above plus voice and is an accomplished tunesmith with scores of great reels, jigs and waltzes to her credit.